I feel very strongly about the benefits of Reiki and Holistic Therapies and believe they are essential in supporting us with our journeys. They can support the ups, downs and opportunities to develop which can be painful, confusing and require courage and strength. I combine Reiki Healing with intuition along with any guidance and support I feel will aid your journey and healing. I am kind and supportive, but also honest in my approach with what I pick up to share with you after your Reiki Healing. Reiki (pronounced ray-key) literally translates to mean ‘Universal Life Force Energy’ in Japanese and is a wonderful form of healing. It supports the balancing & re-energising of the Key Chakra points of the body; providing healing energy where it’s needed. The Reiki Healer (‘Conduit’) carrying out the session connects with the ‘Universal Life Force Energy’ to conduct and support this process. All people experience Reiki energy differently. What is important to note is the energy will heal where it needs to; helping to bring your body back into balance. Reiki balances the body’s Chakras (Energy Centres). This is a natural process that supports relaxation and healing by removing any blocks to this flow of energy in your body; bringing it back into balance and giving support on all levels unique to each person receiving it. Reiki is given fully clothed in a quiet environment and is safe for adults, children, toddlers, mothers–to–be and babies*. It works holistically (whole body, mind & spirit) and is an incredibly relaxing experience. Hands are placed on, or just above the body; this can also be carried out by distance (remote) healing. Each session is unique as it is designed to support your own individual healing process. From where does it originate? This approach to healing was developed by Dr Mikao Usui in the early 20th century. A non-invasive complementary therapy that has been taught and used in the UK since the late 1900s. How does it work during the session? There are so many known and proven benefits from Reiki Healing. Reiki will adjust to the body's needs as necessary to support with the Healing process; re-energising the key Chakra points of the body and providing healing energy where the body requires it. Reiki Healing is safe and non-invasive. Our younger generations are dealing with anxieties, fears, peer pressure and educational pressure. It has proven to be helpful in the treatment of ADD/ADHD, inattentiveness, irritability, emotional issues, hyperactivity and defiance. As Reiki works on all levels of the body (physical, mental, emotional and spiritual); our bodies are able to use the energy to find balance itself and therefore adapts when needed and for the individual. Because Reiki helps to balance regardless of the type of issues it can provide soothing moments for babies, infants and children as well as for adults. How often should you have Reiki? As everyone is different your Reiki journey will be unique for you. However a series of 4 consecutive initial sessions* is recommended with a week in between each one. After this; once every 4 weeks would be a good programme to maintain. NOTE: Some benefit is usually felt right away, but of course long-term conditions are likely to need longer. NOTE: All people experience Reiki energy differently and so trust is the process is so important; allowing the body to re-balance and support the holistic approach to healing and wellness. 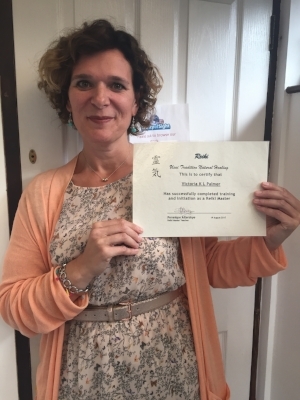 Victoria has been trained on Usui Reiki, however will tailor the healing as best drawn to support the client. * Reiki does not take the place of conventional medicine. Always consult a GP for an acute or infectious condition and problems of urgent concern. Recommended that pregnant women also consult their healthcare professional. Reiki practitioners will not diagnose health problems. 24 hours cancellation notice is required if you are unable to keep the appointment; otherwise full payment may be required. Email Victoria at victoria@asktheangels.uk or via text/call on 07768 962369 or complete the 'Contact me' online form.